i would also remove Deadeye Tracker , Endrek Sahr, Master Breeder , Krav, the Unredeemed , Ophiomancer , Bontu's Monument , Charcoal Diamond , Jet Medallion , and Crypt of Agadeem . i suggested the last 4 because if you replace them with Gauntlet of Power,Black Market, and Caged Sun you have much more mana to play with. i would suggest using tokens to get your commander to go off instead of bigger creatures and use creatures with "enter the battlefield" effects to sack if you do (I'm pretty sure that is how you have it build already though so I'm giving dumb advice). all in all i love the deck just need more tokens and more mana. hope this helps! Your land count is pretty low compared to your average CMC. I suggest no less than 37 for non-competitive lists. Also, I would run some more rocks. Jet Medallion Charcoal Diamond Fellwar Stone for starters. Unstable Obelisk for the upside of getting rid of permanents that Black has trouble with. Hello, I saw the message you left on my wall, and I'm pretty sure this is the deck you were asking about, right? So, when you say competitive, how competitive do you mean? cEDH is somewhat of a different beast from the usual EDH, where decks have average mana costs under 2, and you should be able to goldfish a win early (like turn 3 or earlier) and win through disruption turn 5+ and beyond. Grixis Storm is an established cEDH archetype, and that's most likely what you could slide these Commanders into (Kess and Jeleva are the usual Commanders for such a thing, but there's no reason you couldn't use partners even if they're a little suboptimal; it's the 99 (or 98, in this case) that would be most important to set in stone). Also, cEDH ain't cheap. Your deck will probably have a similar price tag to some of mine if you actually go all out on optimization (for example, check my Breya list here. It can win turn 2 with no acceleration at all, turn 1 with acceleration. The deck has a hard time with disruption, though, which is why it's geared toward winning as fast as possible. If that's what you have interest in, then a complete rework of this deck may be necessary as your mana costs are simply too high to support this at current. So, that said, if you're just wanting a good Vial Smasher/Kraum deck, I can help with that. Keep an idea of swapping Kraum for Silas Renn in the back pocket, though, because he can be nice recursion at a low-creature table. Metallurgic Summoning (card seems meh; it can win via Dramatic Scepter but your draw spells and Comet Storm, etc., do this already). Platinum Angel (it's a nice card, but this doesn't really help you win unless you were absolutely going to lose after you reached 7 mana, and involves nobody having a kill spell. Most of the time, having removal or a counter would be straight up superior to running this card). Kaervek the Merciless (he's a great effect but 7 mana is quite a lot). Strionic Resonator (this doesn't do that much here, not that I can tell. I may be glossing over something, but it's not like this is a Brago deck where this goes infinite with a Sol Ring or something). And 1 land. This'll let you fit the above mana rocks in. Swap Torrential Gearhulk for Mission Briefing . Swap out Murderous Cut for Toxic Deluge , Voidmage Husher for Stifle (the latter isn't reusable but it's 25% of the mana, which is huge). Fire Covenant is better at a lot of tables than Hero's Downfall, I'd make that swap. Curtain's Call could probably just be cut for something, anything, else. I recommend putting Notion Thief into the deck, alongside Wheel of Fortune , Windfall , and possibly Winds of Change . Drawing 20+ cards in one turn all the while forcing your opponents down to 0 cards is hilariously useful, and each of the cards mentioned are reasonably good on their own. Cutting Reforge the Soul, and probably 2 of your worst extra turn/X spells might be valuable, here. Stunt Double could also be cut if you need the space but don't want to drop anything else. Lim-Dul's Vault , Fabricate , Merchant Scroll (finds Dramatic Reversal), Reshape (this one is hit or miss sometimes, but it can be very beneficial to find your Scepter or a mana rock capable of supporting Scepter), Tainted Pact (this deck is perfect for Pact; if you have Reversal and an X spell in your hand, it gets you Scepter. This would be a little better if you were using Vial Smasher/Thrasios since you wouldn't need an infinite mana outlet in hand to use it, but still, it's very, very strong). Frantic Search is free card filtering, and Muddle the Mixture can find anything 2 mana or function as a counter spell if you need it. The flexibility is worth the higher cost to tutor. I, at least, recommend Lim-Dul's Vault, Muddle the Mixture, and Frantic Search. Merchant Scroll would also be very nice. Okay, so that's a bunch of changes, but you should notice a pretty sizable reduction in mana costs across the board, and some pet cards are still left in (copious extra turn spells, Mind's Dilation, etc.) that could probably be up for review at a later date. You should be able to reach 5 mana on turn 3/4, pop an extra turn spell or two, and then assemble an infinite mana combo to win. If you're wanting to go cEDH though, let me know, and I'll show you some things for Grixis Storm. @FeeshSquad, Well, that's sort of rough. Basically the stuff that makes this deck competitive is the expensive rocks (otherwise you have bad ramp) and the expensive tutors (otherwise the deck isn't consistent), but you don't really need Chains, that's just a decent interactive piece. If you really want to you can run worse rocks ( Mind Stone , Charcoal Diamond , Worn Powerstone , Thran Dynamo , Gilded Lotus , etc), and actually worse tutors too (like Diabolic Tutor , Final Parting , Increasing Ambition ). It'll probably be ok as a bigger mana deck, if you use a lot of rocks that tap for 2+ mana. ALthough, if you are going to spend money on cards that are really strong in EDH, Mana Crypt is probably the strongest card you can buy. I suggest substituting Stranglehold for chains of meph. It's very strong and only slightly worse since it costs 4 instead of 2. 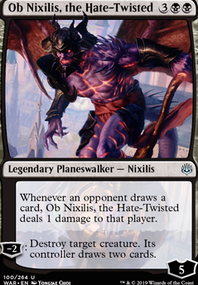 Oooh a solid theme using a card I love flavorwise and I dont see enough (the font) and some great demon choices without clogging up the deck with Shadowborn Apostles. 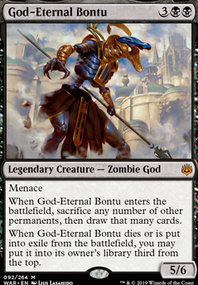 Always like seeing Endrik show up in lists like this, very handy for sacrifices. Sengir Autocrat : A great classic and a good source or early things to feed to your Mindslash and various demons. Culling the Weak : For that early boost in mana when you have creatures to toss, can help get some of the more annoying large demons out in play. Some earlier mana rocks like Charcoal Diamond Worn Powerstone and Hedron Archive etc. I am mostly concerned about your board in the earlier stages of the game before the big demons are out or the graveyards are filled. Lastly a great land for flavor and handy to summon a pretty mighty threat, Westvale Abbey Flip. Also works with the font. For lands, Cabal Stronghold doesn't make any sense. You're running 7 Basic Swamps. If you wanted to put in Cabal Coffers with Urborg, Tomb of Yawgmoth , that could work, but I doubt you want to put your money there. Cascading Cataracts, Waterveil Cavern, Survivor's Encampment, Shimmering Grotto, Rupture Spire, Guildmage's Forum, and Gateway Plaza should be the next to go. You're running a 2-color deck, so you don't need such bad fixing. I'd also lose Everglades. Nighthowler is the only really bad creature that I see, although you'll probably want more if you're on the self-mill plan. Triskaidekaphobia and Tree of Perdition are cute. 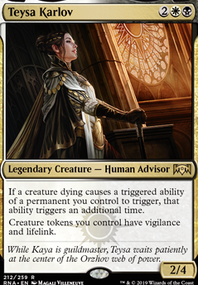 I don't think I would run that, but if you're going to, run Clutch of the Undercity and Dimir House Guard to tutor up the pieces. Spinal Embrace is a cool card, but it's pretty inefficient. 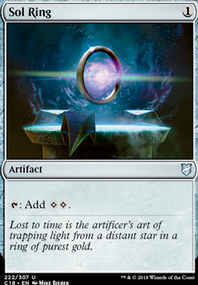 For that kind of mana, you could be running Kindred Dominance , Crux of Fate , Deadly Tempest , Decree of Pain , Extinguish All Hope , or Life's Finale (I would go with this one, given your commander). Cancel is a no-go. Counterspell , Negate , Swan Song , Countersquall , Dissolve , Arcane Denial , Disallow , Sinister Sabotage and Dream Fracture should all be in the deck before Cancel. I don't know why you're running Dramatic Reversal , but if you are, you should be running Isochron Scepter for the infinite mana. Tome of the Guildpact is pretty bad in this deck. 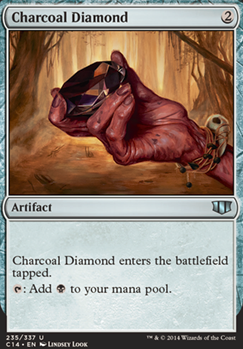 If you want rocks, you should be running Sky Diamond , Charcoal Diamond , Coldsteel Heart , Mind Stone , Thought Vessel , and Talisman of Dominance before you touch that or Darksteel Ingot in a 2-color deck. If you're looking for card draw, Phyrexian Arena , Syphon Mind , Fact or Fiction , Tidings , Sign in Blood , and Night's Whisper are all better. If you wanna mill, Altar of the Brood , Mesmeric Orb , Dread Summons , Sphinx's Tutelage , Psychic Corrosion , Traumatize , Patient Rebuilding , Memory Erosion , and Whetstone are all more powerful than Millstone (though I do appreciate it's OG status). If you want to see what other people are playing in their Scarab God decks, I recommend checking out the EDHREC page for him.